St. Augustine, Fla., founded in 1565, is the oldest continuously occupied European-established settlement within the borders of the continental United States and is a destination for history buffs. But in late November through January it is transformed into a magical destination during the Nights of Lights with over 3 million lights welcoming visitors to the town. My daughter and I visited in December and found a different town from the same old St. Augustine we remembered. First of all, it was Florida chilly, with temperatures dipping into the forties in the evening. The town also has nightlife, with live music from country to rock to salsa and a few singers who were channeling their inner Jimmy Buffett. After all, this is Florida. The restaurant scene will please the palate of the foodies in your crowd. The Castillo de San Marcos has guarded Matanzas Bay and the town of St. Augustine since the 17th century. 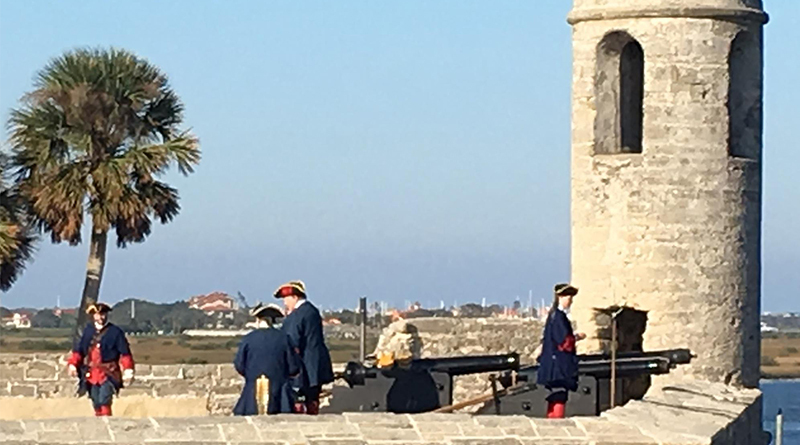 Within its coquina walls, National Park Service rangers dress in period costume and fire cannons while they teach visitors about the history of the fort. 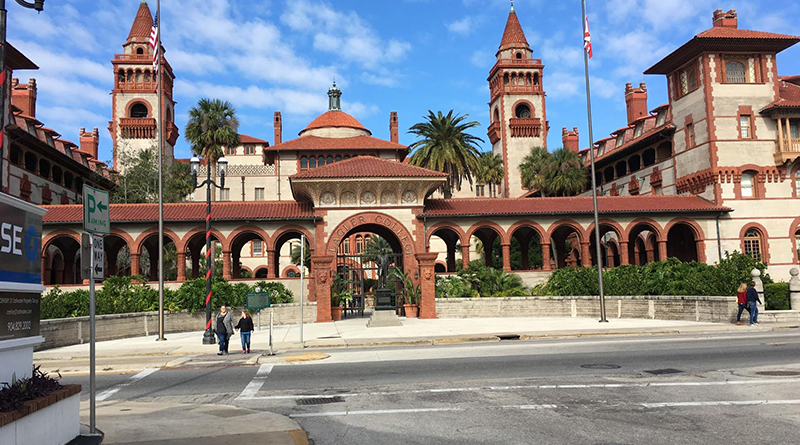 The heyday of tourism in St. Augustine was when Standard Oil co-founder Henry Flagler opened the Ponce De Leon Hotel in 1888. This was the first hotel wired for electricity (guided by Flagler’s friend, Thomas Edison) and with running water in every room. Rooms at the hotel were rented by the season. The former hotel which was designed by Louis Comfort Tiffany now houses Flagler College. The college has restored the interior to its original splendor. Tours of the Spanish-revival architecture including the dining room with 79 Tiffany stained glass windows. Henry Flagler’s second hotel, the Alcazar Hotel, now houses the Lightner Museum. The hotel closed in 1932 and fell into disrepair. Otto Lightner purchased the building in 1947 to house his eclectic collection of Victorian antiquities, including a mummy, shrunken heads, fine art, Tiffany glass, furniture and sculpture. The museum is open to the public. Getting around St. Augustine in a car is fraught with difficulty, from narrow one-way streets, to pedestrian-only thoroughfares, to impossible parking. Fortunately, the town is very walkable, as might be expected from a town in existence for hundreds of years before the advent of automobiles. There is a public parking garage at the north end of town. If you have mobility issues, hop-on-hop-off tour trolleys roam the city. We took a different type of tour of the city, opting for the Haunted Pub Tour. Our tour guide led us to several pubs, regaling us with stories of the former denizens of the buildings who are rumored to remain in spirit. Other nighttime Christmas lights tour choices included trolley tours with “magical viewing glasses,” boat tours and a nighttime walking tour with hot chocolate. Be prepared to sing along with your favorite Christmas classics. If you’re looking to splurge, the Casa Monica Resort and Spa will treat you like royalty. My daughter and I chose to stay at the Peace and Plenty Inn, a bed and breakfast just south of Flagler College. We had a romantic room with a balcony, rather ironic for a mother-daughter trip, but it did make us laugh. In any touristy town, restaurants come and go, but the best ones last. 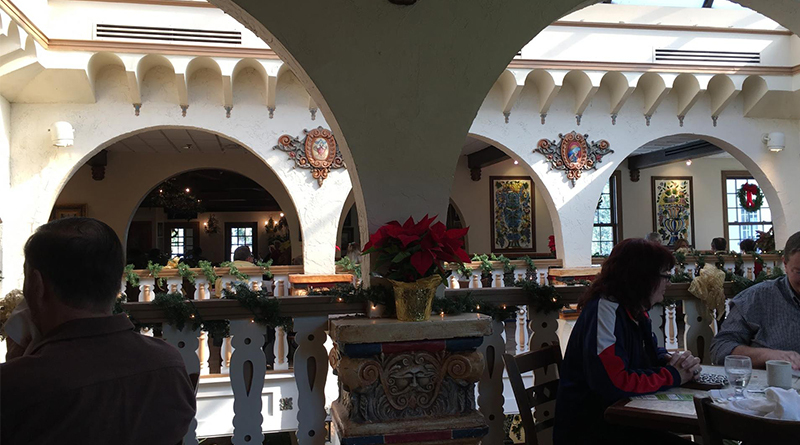 Columbia Restaurant is a Florida favorite, serving Spanish and Cuban cusine. The signature 1905 Salad is named for the year the restaurant opened, and you can’t go wrong with the arroz con pollo (chicken with yellow rice) or the paella. The menu tells the history of the restaurant which is being run by the fourth and fifth generations of the same family. Harry’s Seafood Bar and Grille has been serving New Orleans cuisine since 1987. The specialties include shrimp and grits, and there is live music on the patio. For quick service, try the Spanish Bakery and Café. Favorites here are empanadas and picadillo. Visiting America’s oldest town is a natural choice for historians. But my daughter and I discovered a town that also pleases music lovers, foodies and people of good cheer during the Nights of Lights.